After the two World Wars of the 20th Century, the humanitarian and economic situation in the Middle East and North Africa, the former colonies of the West, became far worse than that that of the entire northern Eurasia, especially Europe. And after 1991, in other words, after USSR’s defeat in the Cold War, the ranks of economically depressed countries were joined by the entire Eastern European region. Such processes always cause people mass migration from their traditional habitats. Not surprising and not unexpected …But due to some reasons of common knowledge the problem has resumed with renewed vigor today and we name it, – the immigration crisis. Indeed, current situation is in the zone between the acute state of crisis and, simply, the war.The most of illegal immigrants are in France, Germany, Italy, Spain and Greece. Nonetheless, the number of illegal immigrants has gone sky-high in the all of North Europe over the last years. Only in the first half of 2015 over 135,000 refugees and migrants arrived in Europe, according to the UNHCR report. This number increased for more than 80 per cent over the same period in 2014. The report said many more people had tried to make the crossing from Africa but did not make it. In May, more than 800 people died when a crowded migrant boat capsized off Libya. Between January and March, 479 refugees and migrants drowned or went missing, the report said, as opposed to 15 in the same three months of 2014. In April, the deadliest month, an “unprecedented” 1,308 migrants and refugees died or went missing, compared to 42 in the previous year. European countries don’t have an economic capacity and a political will to accept all migrants. On August 11, Greek police used pepper spray, fire extinguishers and batons in order to stem the chaos which has broken out at a football stadium on the island of of Kos where more than 1,000 migrants had been locked in without shelter, food or toilets – while they were waiting to be registered. 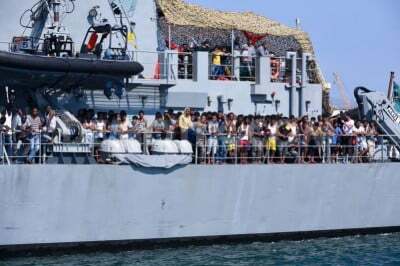 Meanwhile, European Union foreign and defense ministers have agreed on plans to form a naval force to tackle people-traffickers who send boats filled with desperate migrants from Libya to mainland Europe. EU plans to “identify, capture and destroy” potential people-trafficking boats before they can be loaded with people fleeing from conflict in Africa. The naval operation will involve gathering intelligence on smugglers; locating and inspecting boats; and destroying the vessels.In fact, people are getting the impression that EU authority is preparing for a new global war, – the war on immigrants. While by no means a new phenomenon, the number of sub-Saharan African and Middle Eastern migrants traveling across the Mediterranean Sea to reach Europe – along with the associated death toll-is unprecedented in scale. The ongoing wave of immigration followed the so-called ‘revolutionary struggles’ of the media-named Arab Spring, when Saudi Arabia, Qatar and Turkey with support of the US attempted to redraw a map of the Middle East conducting a bloody chaos and arise of terrorism in the region. Since this moment, Europe has become filled out with refugees from the war-torn territories. While various maritime migration routes are used, most of Migrants arrived to France from the Northern Africa and Algeria by the way of Libya and Tunisia. This is the Central Mediterranean route and it is the most heavily trafficked and the deadliest maritime migration route in the world. Record numbers of migrants are not only traveling the Central Mediterranean route, but are also arriving to Germany, Austria and countries of the Central and Northern Europe using the Eastern Mediterranean route that passes through the Aegean Sea from Turkey. Other substantial ways of migration are: an air track from Asia and Arabian Countries to the United Kingdom and Northern Europe , the flow from NATO-humbled Balkans to the European Union and the way from former USSR to the European Union. The complexity of these migration flows is challenging current frameworks, and Europe is struggling to develop a comprehensive architecture that balances efforts to assist persons in need with efforts to secure its borders. Furthermore, this situation highly cuts the proportion of labor migrants and rises the number of refugees and anti-social elements. It has been conducting a growth and strengthening of the ethnical criminality. One must consider the various motivating factors behind immigration: the earlier ones, before the outbreak of the bloody conflicts to the South and East of the EU, and now, when people are forced to save their lives by running where there is still peace. 10-20 years ago the migrants to Europe were predominantly looking for work in order to earn money for their families or were driven by their personal ambitions which could be realized in Europe. However, in the last two-three years the new arrivals in the EU are angry individuals who have lost everything or almost everything due to the horror of war. Many of them have lost their families. And what do you think? Whom do they consider responsible for that? Entry-point states bear unilateral responsibility for migrants under the Dublin Regulation. Revised in 2013, this EU law continues to stipulate that asylum seekers must remain in the first European country they enter. Migrants who travel to other EU states face deportation back to the EU country they originally entered. To facilitate burden sharing across the EU, entry-point states along the Southern periphery have called for the suspension of the Dublin Regulation. However, northern states like Germany are quick to point out that almost a third of 2014’s 626,000 asylum applications were made within its borders. Migrant detention centers along Europe’s southern periphery-in Greece, Italy, Malta, and Spain-have all invited charges of abuse and neglect over the years. Many rights groups contend that a number of these centers violate Article III of the European Convention on Human Rights, which prohibits inhuman or degrading treatment. In Italy, migrants face fines and deportation under the controversial Bossi-Fini immigration law, which stipulates that they must secure work contracts before entering the country. This 2002 law makes illegal migration-and aiding illicit migrants- punishable by fine or jail. Despite its severity, many say the law has done little to curb the flow of migrants in recent years. The situation is especially acute in Greece, which has been hit hard by a five-year debt crisis and successive rounds of austerity measures. Overcrowded facilities lacking proper ventilation, clean water, and sanitation have been blamed for compromising migrants’ health, and police mistreatment and harassment continue to elicit censure from rights groups. The country’s soaring unemployment rates and drastic cuts in public spending mean there is scant economic opportunity and welfare support for migrants and refugees. As with the sovereign-debt crisis, national interests have consistently trumped European ones in the areas of migration and asylum. This was illustrated in 2011, when France briefly reintroduced border controls in the free-movement Schengen area in response to the influx of thousands of Tunisian and Libyan refugees in neighboring Italy. The adoption of fortress policies by several EU member states has come at a high cost, some rights groups contend. However, the part of northern countries have continued to offer more inclusive migration and asylum policies. In September 2013, Sweden announced that it would offer permanent residency to all Syrian refugees. Germany also committed to offering ten thousand Syrian refugees temporary residency in 2013. But some experts say these policies conduct anti-immigrant sentiment that is gaining hold across much of Europe. Many of immigrants come from Muslim countries, and the relationships between these immigrants and the majority populations are tense. In turn, governments just cannot integrate effectively all these immigrants into local society. It establishes a ground for activity of ultra nationalist parties, groups and lone wolfs as Anders Behring Breivik.We can say with certainty that the policy of multiculturalism has completely failed. Interestingly, Angela Merkel stated this as far back as in 2010, and Nicolas Sarkozy in 2011. EU Leaders understood the depth of the problem along at least of 5 years, but it was too late to take effective measures to resolve the problem. At that time it already was clear that the planned actions of US leaded Western hawks in North Africa and the Middle East would cause unprecedented new wave of immigrants with whom it would be impossible to act similarly, even fortress policy would be under defended.The recent economic crisis has also spurred a demographic shift across the continent, with citizens of crisis-hit states migrating to the north in record numbers in search of work. And while the issue of intra-EU migration has sparked anxiety over social welfare benefits in recent months, those who are coming from the Middle East and North Africa tend to provoke more problems in local societies. Experts say that any movement on immigration reform will be difficult with nationalist parties across the continent continuing to make significant gains and the threat of European jihadists returning home from the Middle East and North Africa continues to hold sway in public. Now, the European migration crisis is especial acute. Since 2013, a cruel competition has been going among migrants, European governments and local societies. Immigrants concentrated in the entry point states move to the countries of the Central Europe (Germany, France) and the North Europe (United Kingdom, Sweden, Norway), spread over the whole union. The European governments impacted by critical look of the public opinion and the economic crisis have been trying to stop this process using the more and more gray approaches based on the wide notion of nation security concepts and the disregarding of human rights. However, the para-military operations in the Mediterranean sea and the usage of unadapted capms only conducts an additional exacerbation of migrants often pushed from their homes by the circumstances of insuperable force. In turn, inability of governments to solve the ongoing crisis conducts the anger of European citizens and contributes to the growth of radical parties and movements. Neo Nazis and other destructive marginals feel comfortable in skin of the social tension in Europe. The crisis has been gaining momentum because of a constant military activity of the US and its allies supported by transnational corporations and western moneyed interest over the Middle East, Africa and East Europe. Supporting of so-called ‘moderate rebels’ in the Middle East, illegal coups in the different parts of the world, all these are the ground of the forthcoming migration war in the Europe. Thus, the war-forced migration is a complex issue conditioned by circumstances out of the ordinary and it cannot be solved by any local fortress actions. Mind boggling, US and their allies’ actions lead to the European Unions inward destruction via the inevitable social upheaval, burdened by ethnic and religious issues. Are the US analysts really run so incompetent that they arent able to forecast the simple effects? Or they are…. This film came to being thanks to your support. With your support, having overcome the crisis in the beginning of August, we decided to set ambitious targets to show what we can do together. As you know, much has been done…, but, in an effort to justify your trust and respect, we have tried to bite more than we could chew, which almost led to a halt of the project. A few days ago, we issued an appeal ; it was heard and supported by you. Today we present another analytical film – “Migration War” and we are grateful to say you made it happen – all you who are supporting and sharing our goals and activities. Unfortunately, we are still experiencing shortage in the budget for the project: in September it was less than 50 % of what is needed (about $ 1,200). We ask all our friends to support the project if you can. In any case, we are proud of your attention and moral support.